"Parmesan" redirects here. For other uses, see Parmesan (disambiguation). "Parmigiano" redirects here. For other uses, see Parmigiano (disambiguation). "Reggiano" redirects here. For the dialect of Emilian, see Emilian dialect § Dialects. Parmigiano-Reggiano (/ˌpɑːrmɪˈdʒɑːnoʊ rɛˈdʒɑːnoʊ/, Italian: [parmiˈdʒaːno redˈdʒaːno]) is an Italian hard, granular cheese. The name "Parmesan" is often used generically for the same cheese made outside the traditional areas of production in Italy, although this is prohibited in trading in the European Economic Area under European law. It is named after the producing areas, which comprise the provinces of Parma, Reggio Emilia, Bologna (only the area to the west of the river Reno), Modena (all in Emilia-Romagna), and Mantua (in Lombardy, but only the area to the south of the river Po), Italy. Under Italian law, only cheese produced in these provinces may be labelled "Parmigiano-Reggiano", and European law classifies the name, as well as the translation "Parmesan", as a protected designation of origin. Parmigiano is the Italian adjective for Parma and Reggiano is the adjective for Reggio Emilia. Outside the EU, the name "Parmesan" can legally be used for the same cheese made outside this area, or for cheeses similar to Parmigiano-Reggiano, with only the full Italian name unambiguously referring to Parmigiano-Reggiano cheese. It has been called the "King of Cheeses" and a "practically perfect food". Parmigiano-Reggiano is made from unpasteurized cow's milk. The whole milk of the morning milking is mixed with the naturally skimmed milk (which is made by keeping milk in large shallow tanks to allow the cream to separate) of the previous evening's milking, resulting in a part skim mixture. This mixture is pumped into copper-lined vats (copper heats and cools quickly). Starter whey (containing a mixture of certain thermophilic lactic acid bacteria) is added, and the temperature is raised to 33–35 °C (91–95 °F). Calf rennet is added, and the mixture is left to curdle for 10–12 minutes. The curd is then broken up mechanically into small pieces (around the size of rice grains). The temperature is then raised to 55 °C (131 °F) with careful control by the cheese-maker. The curd is left to settle for 45–60 minutes. The compacted curd is collected in a piece of muslin before being divided in two and placed in molds. There is 1100 L (291 US gallons or 250 imperial gallons) of milk per vat, producing two cheeses each. The curd making up each wheel at this point weighs around 45 kg (100 lb). The remaining whey in the vat was traditionally used to feed the pigs from which Prosciutto di Parma (cured Parma ham) was produced. The barns for these animals were usually just a few yards away from the cheese production rooms. The cheese is put into a stainless steel, round form that is pulled tight with a spring-powered buckle so the cheese retains its wheel shape. After a day or two, the buckle is released and a plastic belt imprinted numerous times with the Parmigiano-Reggiano name, the plant's number, and month and year of production is put around the cheese and the metal form is buckled tight again. The imprints take hold on the rind of the cheese in about a day and the wheel is then put into a brine bath to absorb salt for 20–25 days. After brining, the wheels are then transferred to the aging rooms in the plant for 12 months. Each cheese is placed on wooden shelves that can be 24 cheeses high by 90 cheeses long or 2160 total wheels per aisle. Each cheese and the shelf underneath it is then cleaned manually or robotically every seven days. The cheese is also turned at this time. At 12 months, the Consorzio Parmigiano-Reggiano inspects every wheel. The cheese is tested by a master grader who taps each wheel to identify undesirable cracks and voids within the wheel. Wheels that pass the test are then heat branded on the rind with the Consorzio's logo. Those that do not pass the test used to have their rinds marked with lines or crosses all the way around to inform consumers that they are not getting top-quality Parmigiano-Reggiano; more recent practices simply have these lesser rinds stripped of all markings. The average Parmigiano-Reggiano wheel is about 18–24 cm (7–9 in) high, 40–45 cm (16–18 in) in diameter, and weighs 38 kg (84 lb). All producers of Parmesan cheese belong to the Consorzio del Formaggio Parmigiano-Reggiano (Parmigiano-Reggiano Cheese Consortium), which was founded in 1928. Besides setting and enforcing the standards for the PDO, the Consorzio also sponsors marketing activities. As of 2017[update], about 3.6M wheels (approx. 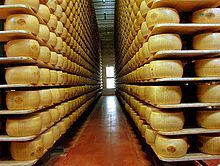 137,000 metric tons) of parmesan are produced every year; they use about 18% of all the milk produced in Italy. Most workers in the Italian dairy industry (bergamini) belong to the Italian General Confederation of Labour. As older dairy workers retire, younger Italians have tended to work in factories or offices. Immigrants have filled that role, with 60% of the workers in the Parmesan industry now immigrants from India, almost all Sikhs. Parmigiano-Reggiano is commonly grated over pasta dishes, stirred into soups and risottos, and eaten on its own. It is often shaved or grated over other dishes like salads. Slivers and chunks of the hardest parts of the crust are sometimes simmered in soup. They can also be roasted and eaten as a snack. According to legend, Parmigiano-Reggiano was created in the course of the Middle Ages in Bibbiano, in the province of Reggio Emilia. Its production soon spread to the Parma and Modena areas. Historical documents show that in the 13th and 14th centuries, Parmigiano was already very similar to that produced today, which suggests its origins can be traced to far earlier. During the Great Fire of London of 1666, Samuel Pepys buried his "Parmazan cheese, as well as his wine and some other things" to preserve them. In the memoirs of Giacomo Casanova, he remarked that the name "Parmesan" was a misnomer common throughout an "ungrateful" Europe in his time (mid-18th century), as the cheese was produced in the town of Lodi, Lombardy, not Parma. Though Casanova knew his table and claimed in his memoir to have been compiling a (never completed) dictionary of cheeses, his comment has been taken to refer mistakenly to a grana cheese similar to "Parmigiano", Grana Padano, which is produced in the Lodi area. 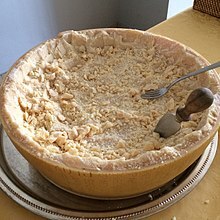 Parmigiano-Reggiano has been the target of organized crime in Italy, particularly the Mafia or Camorra, which ambush delivery trucks on the Autostrada A1 in northern Italy between Milan and Bologna, hijacking shipments. The cheese is ultimately sold in southern Italy. Between November 2013 and January 2015, an organized crime gang stole 2039 wheels of Parmigiano-Reggiano from warehouses in northern and central Italy. Parmigiano is also particularly high in glutamate, containing as much as 1.2 g of glutamate per 100 g of cheese. The high concentration of glutamate explains the strong umami taste of Parmigiano. A wheel of Parmigiano-Reggiano manufactured in January 2014 in Spilamberto with DOP marking and "Parmigiano-Reggiano" written vertically around the complete edge of the wheel. An official certification will be stamped into the central oval when it is graded. Voice of America report showing production of the cheese and imitations using the name without authorization. The name is legally protected and, in Italy, exclusive control is exercised over the cheese's production and sale by the Parmigiano-Reggiano cheese Consorzio, which was created by a governmental decree. Each wheel must meet strict criteria early in the aging process, when the cheese is still soft and creamy, to merit the official seal and be placed in storage for aging. Because it is widely imitated, Parmigiano-Reggiano has become an increasingly regulated product, and in 1955 it became what is known as a certified name (which is not the same as a brand name). In 2008, an EU court determined that the name "Parmesan" in Europe only refers to Parmigiano-Reggiano and cannot be used for imitation Parmesan. Thus, in the European Union, "Parmigiano-Reggiano" is a protected designation of origin (PDO – DOP in Italian); legally, the name refers exclusively to the Parmigiano-Reggiano PDO cheese manufactured in a limited area in northern Italy. Special seals identify the product as authentic, with the identification number of the dairy, the production month and year, a code identifying the individual wheel and stamps regarding the length of aging. Generic parmesan cheese is a family of hard grating cheeses made from cow's milk and inspired by the original Italian cheese. They are generally pale yellow in color, and usually used grated on dishes like spaghetti, Caesar salad, and pizza. American generic parmesan is frequently sold already grated. Within the European Union, the term Parmesan may only be used, by law, to refer to Parmigiano-Reggiano itself, which must be made in a restricted geographic area, using stringently defined methods. In many areas outside Europe, the name "Parmesan" has become genericized, and may denote any of a number of hard Italian-style grating cheeses, often commercialized under names intended to evoke the original: Parmesan, Parmigiana, Parmesana, Parmabon, Real Parma, Parmezan, Parmezano, Reggianito. After the European ruling that "parmesan" could not be used as a generic name, Kraft renamed its grated cheese "Pamesello" in Europe. Generic parmesans may be legally defined in various jurisdictions. In the United States, the Code of Federal Regulations includes a Standard of Identity for "Parmesan and reggiano cheese". This defines both aspects of the production process and of the final result. 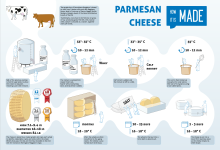 In particular, parmesan must be made of cow's milk, cured for 10 months or more, contain no more than 32% water, and have no less than 32% milkfat in its solids. Most grated parmesans in the US have cellulose added as an anti-caking agent, with up to 4% considered acceptable under Federal law. Several manufacturers have been investigated for allegedly going beyond the 4% limit. In one case, FDA findings found "no parmesan cheese was used to manufacture" a Pennsylvania manufacturer's grated cheese labeled "Parmesan", apparently made from a mixture of other cheeses and cellulose. The manufacturer declared bankruptcy in 2014 and their president was expected to plead guilty to criminal charges, facing up to $100,000 in fines and a year in jail. Parmesan cheeses are rich in umami flavors. They are generally used as a condiment for prepared foods, rather than being eaten by itself on a cheese plate. Kraft Foods is a major North American producer of generic parmesan and has been selling it since 1945. As parmesan is a common seasoning for pizzas and pastas; many major pizza and pasta chains offer it. Soy-based alternatives to Parmesan cheese exist. Outside Europe, commercially produced cheeses in the style of Parmigiano-Reggiano may be legally sold under the generic name Parmesan cheese. When sold in Europe, such cheeses are obliged to be sold under other names, such as Kraft's "pamesello italiano". It is produced mainly in Lombardy; "Padano" refers to the Po Valley (Pianura Padana). Cows can also be fed silage, not grass and hay only. The milk contains slightly less fat. Milk of several days can be used. No controlled proceedings over cow breeds. Minimum aging of 9 months. Gran Moravia is a cheese from the Czech Republic similar to Grana Padano and Parmigiano. Reggianito is an Argentine cheese similar to Parmigiano. ^ Ruggeri, Amanda (2019-01-28). "Italy's practically perfect food". Retrieved 2019-02-01. ^ "Standard di Produzione Archived 2006-05-13 at the Wayback Machine". Disciplinare del Formaggio Parmigiano Reggiano D.O.P. (fourth paragraph). Famiglia Gastaldello, 2005–2008. ^ Mitzman, Dany (25 June 2015). "The Sikhs who saved Parmesan". BBC News. Retrieved 5 February 2018. ^ Giovanni Boccaccio, Decamerone VIII 3. The translation quoted here is that by J.M. Rigg Archived 2008-10-14 at the Wayback Machine. ^ McMahon, Barbara (3 December 2006). "It's hard cheese for Parmesan producers targeted by Mafia". The Guardian. Retrieved 18 February 2016. ^ "Maxi-furto di Parmigiano Reggiano: rubate 2mila forme, 11 arresti" [Parmigiano Reggiano heist: 2000 wheels stolen, 11 arrested] (in Italian). 24 September 2015. Retrieved 18 February 2016. ^ Marsha A. Echols Geographical Indications for Food Products – 2008 Page 190-"A defence was that the name 'Parmesan' has become generic and so cannot be a protected designation of origin. The Court disagreed. It commented that 'in the present case it is far from clear that the designation parmesan has become ..."
^ Zeldes, Leah A. (2010-10-06). "Eat this! Parmigiano-Reggiano, the king of cheeses". Dining Chicago. Chicago's Restaurant & Entertainment Guide, Inc. Retrieved 2010-11-17. ^ Preedy, Victor R.; Watson, Ronald Ross; Patel, Vinood B., eds. (2013-10-15). Handbook of cheese in health: Production, nutrition and medical sciences. The Netherlands: Wageningen Academic Publishers. p. 264. doi:10.3920/978-90-8686-766-0. ISBN 978-90-8686-211-5. Retrieved 2014-05-30. ^ Wisconsin Cheese: A Cookbook and Guide to the Cheeses of Wisconsin – Martin Hintz, Pam Percy – Google Books. Books.google.com. 2008-02-26. Retrieved 2014-05-30. ^ Cox, James (9 September 2003). "What's in a name?". USA TODAY. Retrieved 27 November 2014. ^ Olmsted, Larry (November 19, 2012). "Most Parmesan Cheeses in America Are Fake, Here's Why". Forbes. ^ a b Lydia Mulvany. The Parmesan Cheese You Sprinkle on Your Penne Could Be Wood: Some Brands Promising 100 Percent Purity Contained No Parmesan at All. Bloomberg Business. 16 February 2016. Retrieved 16 February 2016. ^ Taste: Surprising Stories and Science about Why Food Tastes Good – Barb Stuckey – Google Books. Books.google.com. 2013-03-26. Retrieved 2014-05-30. ^ Justin M. Waggoner (12 October 2007). "Acquiring a European Taste for Geographical Indications" (PDF). Retrieved 2014-09-22. ^ Brodsy, Alyson. "U.S. cheese maker says it can produce Parmesan faster | Business | Indiana Daily Student". Idsnews.com. Retrieved 2014-05-30. ^ History of Cheese, Cream Cheese and Sour Cream Alternatives (With or Without ... - William Shurtleff, Akiko Aoyagi – Google Books. Books.google.com. 2013-10-22. Retrieved 2014-05-30. ^ Cox, James. "What's In a Name?" USA Today, 9 September 2003. ^ Smetana, Jiří (15 February 2010). "Italové kupují český "parmazán" z Litovle" (in Czech). iDnes. Retrieved 10 November 2014.